Advice on how to plaster board a ceiling and plastering over it. 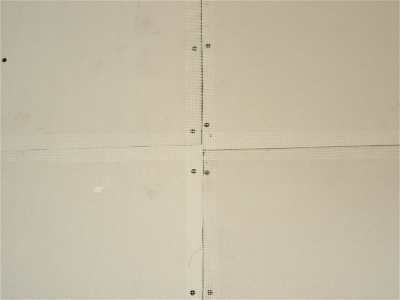 Plasterboard sheets 9.5mm x 90cm x 180cm, Galvanised screws 25mm x No. 6, finishing plaster, water, skrim tape. Claw hammer, cordless screwdriver, tape measure, Stanley knife, straight edge, hop-up, dead man, pad saw, rasp, float, bucket trowel, buckets, brushes, mixing tool, spot board, hawk, pencil, sweeping brush, floor covering, tin snips, trestle or working platform. 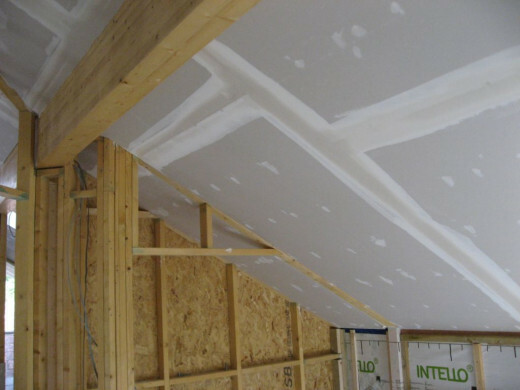 Measure the area of the ceiling and calculate if there are enough materials on site prior to beginning work. Using the claw hammer and cordless drill, remove any screws, nails or other bits protruding from the face of the beams in the ceiling. 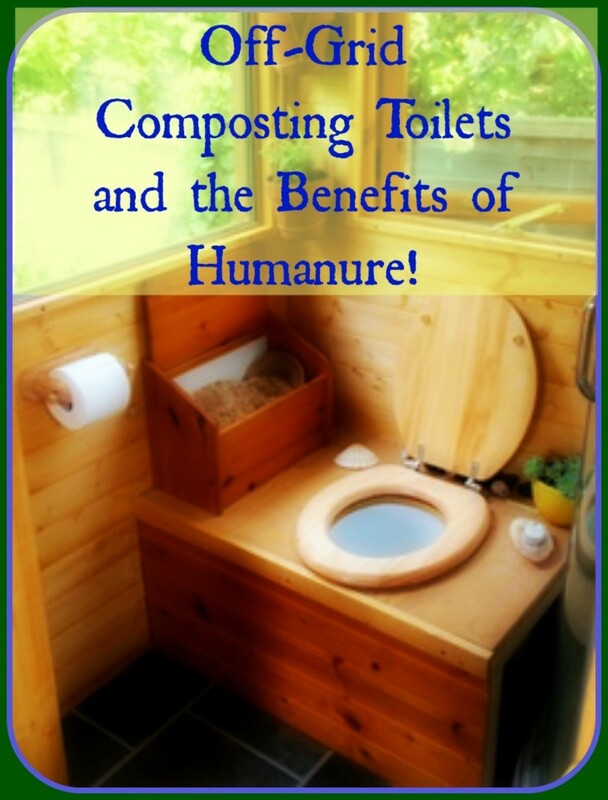 Ensure that the beans show no signs of damp and are debris free. Mark on each of the walls the positions of the beams using the pencil. Ensure through the site foreman, that all other trades, such as plumbing and electrical trades, have finished their work which includes pipes and the laying of cables.Cover the work area floor if necessary. All trowels and spot board should be damp or wet prior to use. Presuming the beams are running from left to right the plasterboards must span the beams in the opposite direction. This allows the end of the length of the plasterboard to finish halfway across a beam for adequate securing. 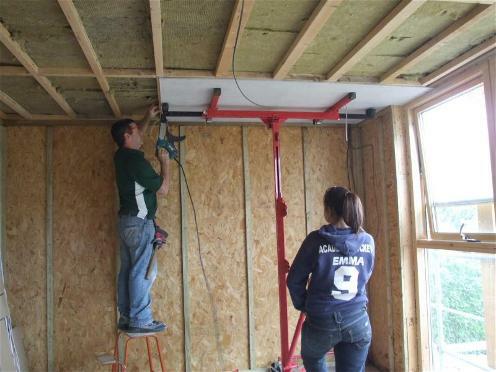 Starting in the right hand side of the room, measure from the wall to the furthest beam which allows the board to finish in the centre of a beam. Using the Stanley knife, cut the board to that measurement. 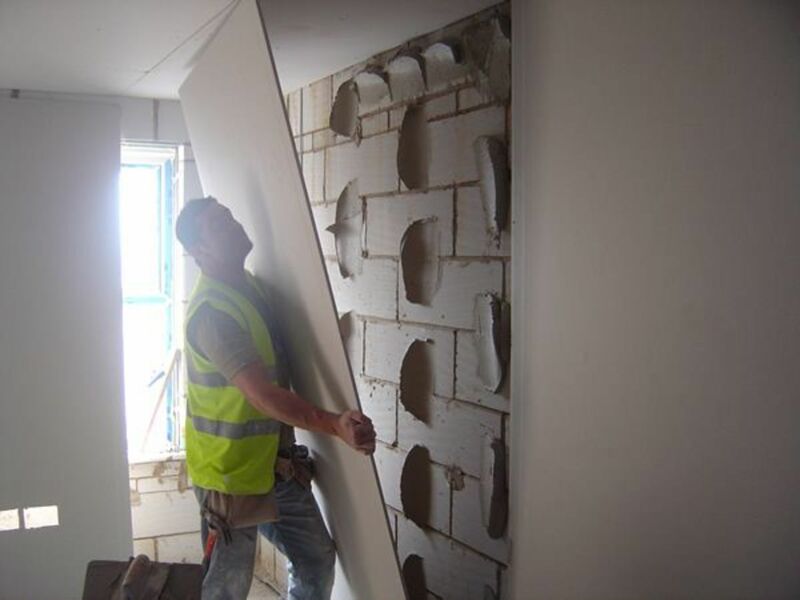 For example, if a center of a beam is 165cm from a wall, cut the plasterboard to 165cm. Always cut the plasterboard on the front ( the lighter papered side ). The cut edge of the board will be positioned next to the first wall. Measure the boxed in corner and cut this section out of the plasterboard. Remembering to allow the plasterboard to be turned over and placed paper side down on the ceiling. Offer the plasterboard up to the ceiling and temporarily secure using the dead man. If correctly fitting, with an approximate 3mm gap between the plasterboard and each of the walls, begin to screw into position. Screws should be no more than 300mm apart and should not break the paper, but should be flush with the top of the plasterboard. Once the first row of plasterboard is complete along one side of the wall, start the next row from the opposite side of the room, but still next to the plasterboard just secured to the ceiling. This will allow for a staggered joint, which prevents the finishing plaster from cracking. There should be an approximate 3mm gap between each piece of plasterboard. Use the Pad Saw to cut a hole in the centre of the room for the electrical wire for the light. Feed the wire through the hole and ensure the end is sealed with electrical tape. Using scrim tape, Scrim around each of the plasterboard joints and the edges where the ceiling meets the wall. 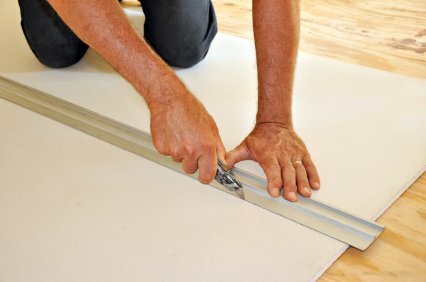 Ensure the scrim tape is evenly distributed between both connecting boards or the boards and the wall. Press firmly into position with float. Lightly dampen the top of the walls where the walls meet the ceilings, this will help prevent plaster from sticking to the wall. Mix the appropriate amount of finishing plaster with water in a bucket. Lightly skim over all the scrim tape on the ceiling. This only needs to literally cover the scrim tape and does not need to be thick. 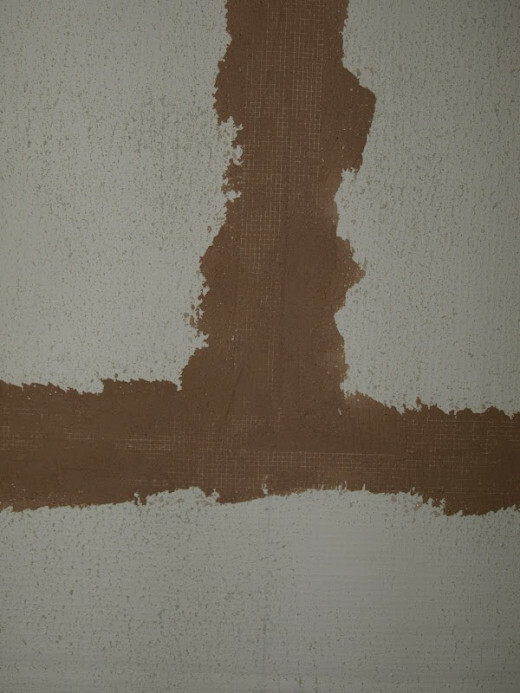 Allow a trowel / float width over the tape so the plaster will cover the scrim and be 3 -4 inches either side of it. Allow a few minutes for the plaster to ‘pull in’ prior to applying the first full coat of plaster. This is when the applied plaster is not tacky to the touch. The first coat should be started from one corner of the room and you should work in a clockwise direction. Each stroke of plaster should stretch from the wall and across the ceiling as far as you can comfortably reach. Perform one stroke with the trowel, then do a second right next to it. Then without any plaster on the trowel go over the initial two strokes lightly. This will help smooth it off a bit. Remember, you only need up to 3 mm of plaster on the ceiling. Continue with this method until all the outside of the ceiling has received the first coat of finishing plaster. 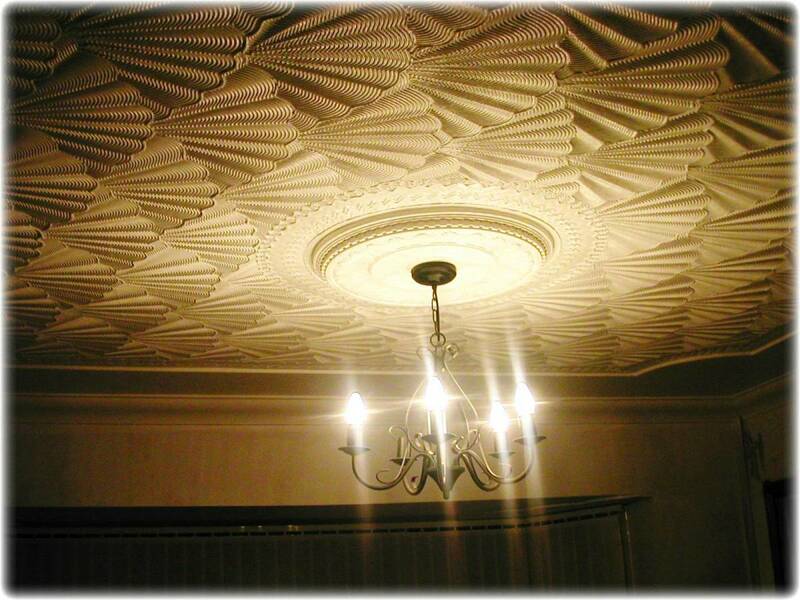 Begin to fill in the center of the ceiling with longish strokes of the trowel with plaster on it. The strokes should continue in the same direction as the initial strokes. That is the first coat finished. Allow the first coat of plaster to become slightly stiff and not tacky to the touch. 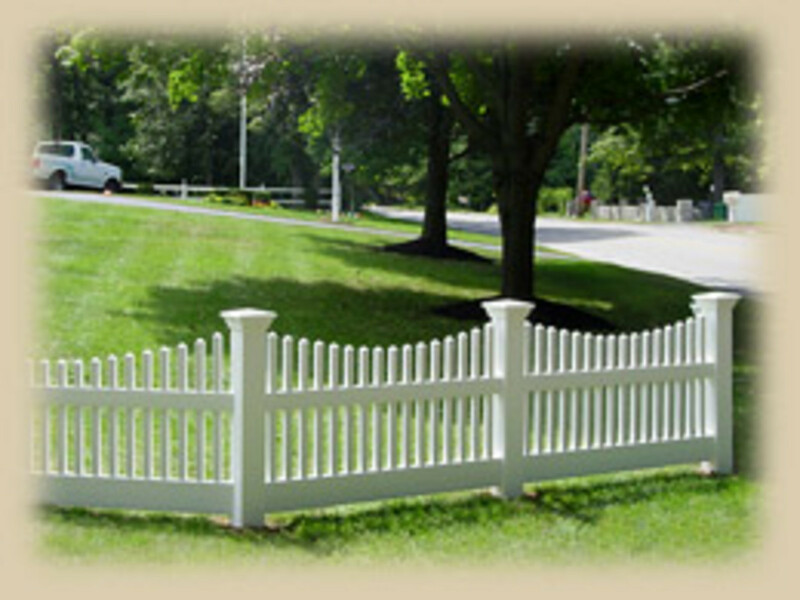 The second coat is merely a scraping just to fill in any hollows and smooth away lines left by applying the first coat. Apply the second coat in the same way as the first. Start from the same place and use long strokes with the plaster float. Once the second coat has gone on, leave for a few minutes until again not tacky to the touch. 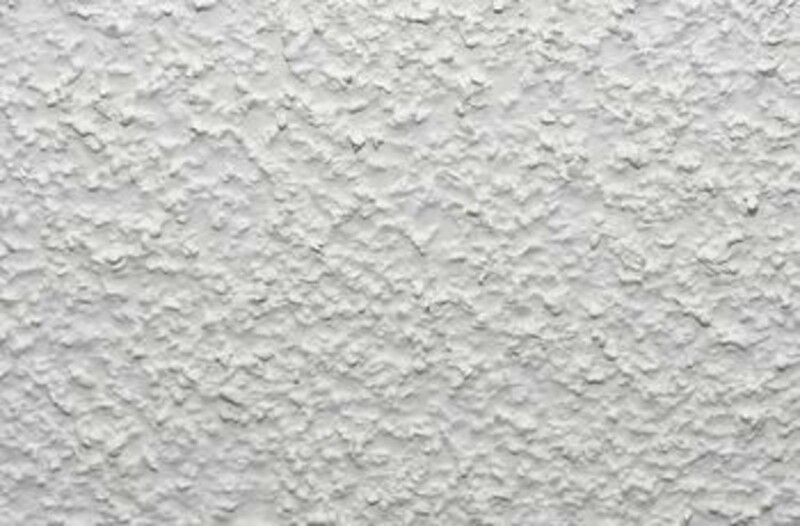 Lightly spray or brush a small edge of the ceiling with water. 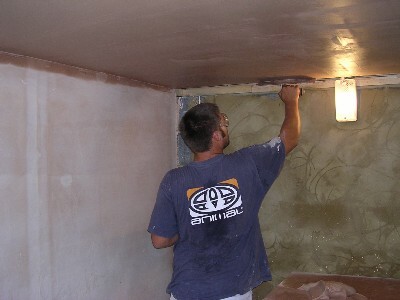 Using the trowel, without any plaster on it, stroke over the ceiling with the trowel at an approximate 45 degree angle. 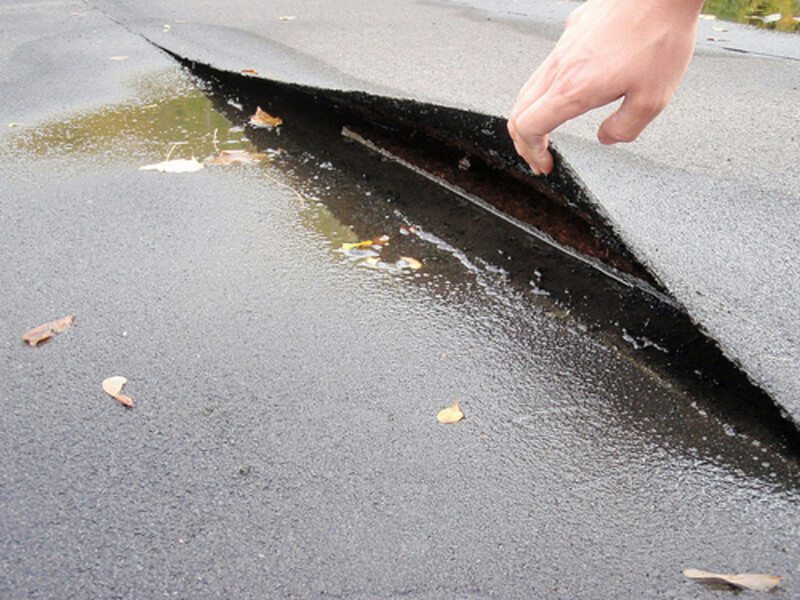 This motion should produce a more smoother surface and is called wet troweling. Any excess plaster on the trowel should be washed off after several strokes.This plaster is called 'fat' and is no good. Repeat this performance again along the whole ceiling. Repeat again but without the water, this is called dry troweling. Wet Trowel: Use a brush to lightly dampen the plaster before troweling smooth. Dry Trowel: Polish the plaster just using a trowel to smooth the plaster. NB: At all times, any trowel, float or bucket that comes into contact with the plaster should be kept wet or moist constantly to prevent the plaster from drying on the tools.